Tteokbokki shops lined up on both sides of the street in Sindang-dong Tteokbokki Alley. Main menu is instant Tteokbokki. 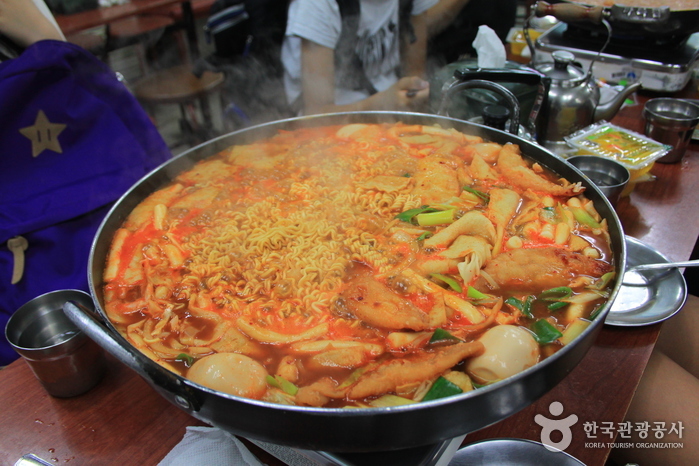 There are satisfying amount of Jjolmyeon (cold chewy noodles), boiled eggs, dumplings, fish cakes and rice cakes on a frying pan so that the customers can boil it on the table. It has a long history, and customers vary in ages including students, office workers, home makers and families. Each store boasts its own unique flavor. People from other regions of Korea come to visit.